Flipped instruction (the flipped classroom model, vodcasting, time-shifting) is an attractive concept because of the in-class time that is freed to work through concept application and discussion. One of the criticisms of this teaching tool is that students receive knowledge in a passive state – by watching video. 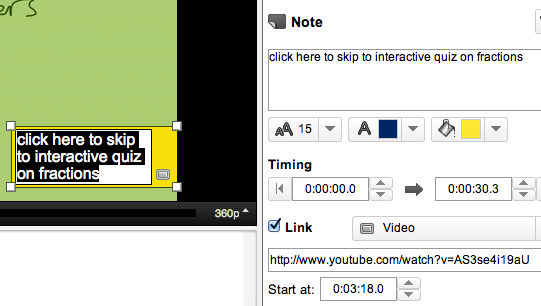 In an attempt to create a more interactive experience for students, YouTube annotations and time-markers can be used to create “check-ins” as the lesson progresses. Below is a simple proof of concept* using a review of fractions. There are an infinite amount of creative possibilities using these free tools, and they work when viewed at YouTube.com or when embedded into a class website. How might you use these tools – feel free to comment below. *This is just a proof of concept. Audio quality is low and audio/video channels get out of sync towards the end. Okay… now as the teacher creates these supposedly interactive electronic presentations to whom do they belong? Youtube? The school system? The flipped classroom gurus who own the websites pushing this new fad on teachers? Wow… a seven minute video on fractions which could be created using OLD tools in half the time on a white board and responding IMMEDIATELY to the individual questions of students. Oh yes, I forgot… there are students who do not feel comfortable about raising their hand and asking a question…… Goodness, I guess the next time I have a question in the REAL WORLD I’ll have to wait a day for the answer… what suspense! What stimulation! What a crock of something other than gold. Thanks for the comment. You seem to be passionate about your position. Please consider writing a point/counterpoint piece for the “To Flip or not to Flip” upcoming edition of ISTE’s Leading & Learning magazine…the deadline is April 9th. This video is merely a proof-of-concept. I’m trying to push against some of the limitations that video delivery creates. It is simple, it is rough, it is not particularly inspired – just an experiment with a simple concept. Ownership: Please refer to your teaching contract and any Use Agreements you have accepted in creating online accounts. I haven’t met any flipped gurus who own their own content-management systems for videos but would be wary of such a product. 7 minutes on fractions: Not sure if you got a chance to watch the video – this tutorial is long because it has pauses for student response time and also includes a video description for both the right & wrong answer for each question. Students can use buttons to move forwards & backwards within the tutorial. A student that understands the concept can be done in 1 minute. Those that find value in the lesson might spend 5 minutes. Wait a day for a response: Many of the teachers I’ve spoken with that use Web 2.0 tools to connect with students don’t spend hours crafting a tutorial and then disappear. Most use video, bulletin boards, blogs, email and instant messaging to connect students with each another, teachers & mentors. My students know that they can contact me until 10pm on weekdays and that I will reply as soon as possible. When they come up with solutions to their obstacles, they are deputized to help others. This is how we’ve built our learning community. I find tools that work for my teaching style & my students’ learning profiles. I share what I learn here, good or bad, in the hopes of receiving feedback and sharing ideas with others. I think someone needs a lesson in posting etiquette. Feel free to challenge opinions of others, but to write in a sarcastic tone is unacceptable. I hope you don’t talk to your students in this way. The flipped classroom model may not fit your teaching style. Fine! Who is to say that the way you teach is best for kids? Teaching they way you were taught may not be the best method for students today. Thank you for disagreeing, but I hope you can do it in a more appropriate and “adult” manner next time. Love this idea! A note with a link is a powerful way to interact with a video. It’s a huge plus for the flipped classroom model. Thanks. Jac, thank you for this share. Will look into it. Like to use variety in my intergration of technology in my 7th grade class. I appreciate you taking the time. PS Not sure I would have answered so well to some of these posts. Kudos to you for staying professional and encouraged with the fact that this will give others ideas to motivate and engage all students, even for the smallest tasks.